Katie and her husband, Andy, are seventh generation farmers raising farm kids, corn, soybeans, and seed corn with Andy’s family in north central Illinois. The story could start with a farmer and a food scientist walk into a bar . . . or a restaurant . . . or a grocery store . 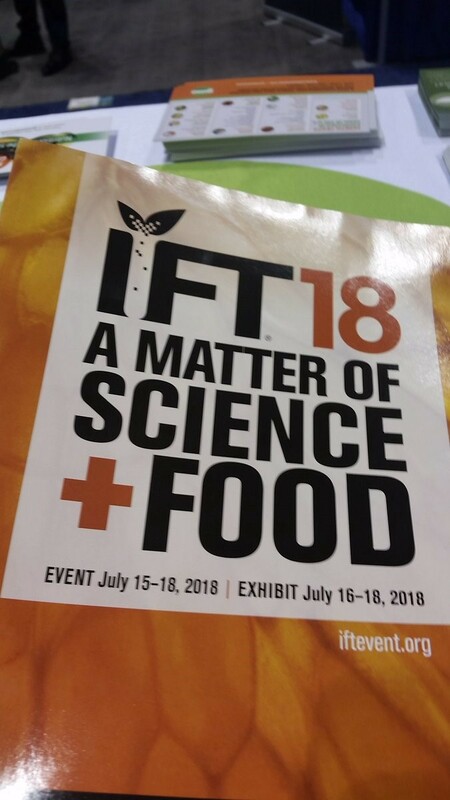 . . or the Food Expo at IFT18: A Matter of Science and Food. Although they stand at opposite ends of the food chain, their topic of conversation is food — sustainability, security, waste and innovation. Thus was my experience at the Institute of Food Technologists’ annual conference in Chicago this July. My family and I farm in northern Illinois. We live in corn country; thus we raise corn, seed corn, soybeans and our kids grow popcorn. Their seventh crop will be ready for #harvest18 in a few weeks. We plant genetically modified and non-genetically modified seed in our fields. Genetically modified organisms (GMOs) are a tool backed by sound science, tested, regulated and proven to pay dividends in our ability to care for our soil and water while producing more with less. In addition to my role as farm chef, chauffer and ‘go-fer, I am also the ‘talker’ and spend quite a bit of time sharing our reasons for supporting and using GMOs on our farm. I attended IFT18 as a guest of GMO Answers and spent a day at the organization’s booth on the massive floor of the Food Expo. Upon arrival, I checked in and wandered to the exhibit hall noticing pro-science messages everywhere. The conference title was clear “A Matter of Science and Food.” But when I entered the massive exhibit hall, the message got muddled. Aisles lined with companies dealing in all things food were also lined with labels. Regardless of their business — fragrance, preservation, taste, ingredients, processing, sourcing or packaging — labels coated each booth. Free-from this, that and the other. No X, Y and Z. Non 1, 2 and 3. Natural, organic, grass-fed, pasture raised, and of course Non-GMO Project verified. Some who stopped were buyers who questioned the ingredients they were tasked to source. “I source coconut for my company,” explained one woman. “So where do I find non-GMO coconut?” My response, “Anywhere you find coconut. They are all non-GMO.” She was stunned. She had assumed because a client asked for non-GMO coconut there must be a GMO-coconut on the market. Not the case. Only ten crops have a genetically modified counterpart. Her disbelief turned to frustration and my #2 takeaway. 2) Crafting a scientific message that can be — should be — heard by their marketing counterparts is a great source of frustration for food scientists. It struck me that this segment of the food chain — scientists — are where we farmers and ranchers were about a decade ago. Frustrated with the misinformation circulating about animal welfare, care for the environment, GMOs . . . we had to learn how to manage public relations. We’ve made great strides in sharing the hows and whys of farming with a world of non-farmers. The scientists I met seem to be on the cusp of a communication epiphany. They understand the need to communicate the what and how of their profession, because . . .
3) . . . discussion of sustainability, food insecurity and food waste are everywhere! From small-town USA to the developing world, our planet is hungry and our ability to understand science affects our ability to innovate, to discover solutions to very timely problems. Whether we are farmers or food scientists by trade, these are the topics du jour. We discuss them at our dinner table and at our respective industry conferences. We read about them in our trade publications and listen to podcasts focused on solutions. Several workshops and featured speakers highlighted these topics throughout IFT18. A panel discussion moderated by famed journalist Tamar Haspel focused on the source of farmers and scientists’ frustration — food marketing. The session titled “The Clash of Consumer Demands with Responsible Food” focused on the murky area of food labels and marketing — when seemingly well-intentioned consumer demands result in less than friendly practices for the health of the environment and people. It was a long session filled with twitter worthy comments. It ended with this universal conclusion: Science literacy must make a comeback in our schools, in our universities, in our daily conversations. Because when we understand the world around us, be it a field, a pasture, a laboratory or a bar, our ability to do better grows.